We've all seen it and, if we're honest with ourselves, we've probably all done it, too. The "it" I'm referring to is bad driving. Unfortunately, more and more, I think the offender knows what they're doing is wrong and just thinks the rules don't apply to them. However, in many cases, the bad driver may not even be aware that they're doing anything wrong through either ignorance of the law or just not paying attention and would likely alter their behavior if they knew the problems they were causing. That is the intention of this page. Below is a discussion of commonly-violated traffic laws along with some (in my opinion) good driving habits. Hopefully, enough people will read this and modify their driving accordingly resulting in a safer and more pleasant driving experience for all of us. Whenever applicable, I've quoted the Texas Transportation Code. Those references are in a gray box and start with the section number (e.g. §545.066.) Wherever you see the term "operator" in the law, it is referring to you, the operator of a vehicle. After each citation, I've included my own comments to help better explain or clarify the law. If you want to look up the the laws yourself, you can do so at http://www.statutes.legis.state.tx.us/?link=TN. Almost everything pertaining to traffic laws is in Sections 544 and 545. The Texas Department of Public Safety's Driver's Manual is also online at http://www.dps.texas.gov/internetforms/Forms/DL-7.pdf. The Texas Manual of Uniform Traffic Devices, which is the official "law" regarding the meaning of traffic signs, signals, and markings, is at http://www.txdot.gov/government/enforcement/signage/tmutcd.html. One thing you should remember-- aggressive, arrogant, dangerous, or just plain bad driving can get you killed. Besides the obvious risk from getting killed in a wreck that such driving often causes, your actions may cause other drivers to become angry or even enraged, the phenomena known as "road rage." Someday, you may cut someone off or zip by somebody on the shoulder, and that person may go berserk, follow, and and kill you. So be cool and "drive friendly"-- it could very well save your life. Many of you find this site after getting a ticket or being involved in an accident. Oftentimes, you've been cited with something you hadn't heard of before, or you dispute the allegation. You may or may not find the answer here. If not, I encourage you to continue your search. In the end, you may find that the citation is valid. If that's the case, then take your medicine and pay the fine or, better, take defensive driving, and consider it a learning experience. However, I have gotten messages from many folks that clearly indicate to me that sometimes even the police don't always get it right, so it's perfectly reasonable to double-check. Also, it's certainly not unheard of that traffic enforcement (especially speed enforcement) in many places is done for revenue enhancement, and officers may get overzealous and sloppy in their duties as a result. We're all in this together, so your comments and suggestions are welcome. You can reach me using the "contact" link at the top of the page. This page is provided for informational purposes only. The author, his agents, and/or sponsors (herein collectively referred to as "the author") do not offer, nor do they imply that they intend to offer, legal advice or counseling to any individual or organization by providing this information. You should not rely or act upon any information contained herein without seeking legal advice from a duly licensed attorney competent to practice law in your jurisdiction. The information presented on this page is based on a good-faith interpreation of the statutory language cited and is provided on an "as-is" basis without warranties or representations of any kind either express or implied. The author expressly disclaims all liability with respect to actions taken or not taken based upon the information contained herein or with respect to any errors or omissions in such information. Any content that could be construed as advice is an expression of what the author either has done or would do personally in the given situation and is not to be construed as being or giving legal advice to anyone else in any particular or general situation. Links to official sources of information elsewhere on the Internet are provided for reference, but the author makes no representations or warranty of any kind as to the accuracy or any other aspect of the information contained on other Internet sites and specifically disclaims any and all liability for any claims or damages that may result from information on those other sites. What you see on this page is my own good-faith interpretation of the law. If you need legal advice, get a lawyer as I am not a lawyer nor do I play one on TV. If it seems like I'm giving advice on a particular subject, you should interpret that to be my own personal musings on what I have done before or would do in that situation. I try to keep my site up-to-date, but I can't guarantee that something hasn't changed since the last time I checked. I don't rule the world, so I can't control or vouch for the accuracy of what's on other websites that I may suggest to you here. Be sure to eat at least five servings of vegetables and drink eight glasses of water every day. Do unto others as you would have them do unto you. Drive safely. Don't text while driving. Live long and prosper. In addition to not being a lawyer, I'm also not (nor ever have been) a professional traffic engineer or law enforcement officer. Therefore, the explanations below are strictly those of a layman. That said, I've had an inexplicable interest in roads and traffic since I was a youngster and have studied the transportation code at length, and my site has been reviewed by numerous law enforcement officers and traffic engineers over the years (and often referenced by them, I'm told), so I am confident in the accuracy of my interpretations and discussions below. If you do find something you believe is incorrect, I welcome your feedback-- use the Contact link at the top of this page to reach me. The officially-sanctioned meaning for lane markings is not in the Transportation Code. Instead, §544.001 requires the state to maintain an official manual of signs, signals, and markings. This manual, the Texas Manual on Uniform Traffic Control Devices (TMUTCD), is the "law" when it comes to all traffic control devices, including lane markings. The meanings of these devices, as defined in the TMUTCD, is enforceable. YELLOW LINES: Traffic going opposite directions is separated by yellow lines. If you're to the left of a yellow line and you're not intentionally passing somebody, you'd better get over to the right FAST before you see the head ornament of a Mack truck directly in front of you. I see this confusion happen a lot when city folks get off on a rural, two-way frontage road. There are various types of yellow lines; see below for the specifics of each. SINGLE SOLID YELLOW LINE: This is used to mark the left edge of the roadway on a divided highway or separate the left shoulder from the through lane. The use of this marking to mark the center of a two-way road is non-standard and has no official meaning. SOLID YELLOW LINE ON YOUR SIDE, BROKEN YELLOW LINE ON THE OTHER: You may not pass when there is a solid yellow line on your side. Traffic on the side of the road with the broken (dashed) line is allowed to pass. Two sets of these, with the broken lines facing each other, are used to demarcate two-way center left turn lanes. BROKEN YELLOW LINE: A single broken (dashed) yellow line means that passing is permitted in both directions. BROKEN DOUBLE YELLOW LINES: This marking is fairly rare and is used to separate reversible lanes (i.e. lanes that can change direction.) Pay attention to and obey the lane control signs or signals. WHITE LINES: These separate traffic going the same direction. There are several varieties of white lines; see below for the meanings of each. DOUBLE WHITE LINES: Parallel white lines indicate that changing lanes or turning across the lines is prohibited. Doing so may be dangerous or interrupt the smooth flow of traffic. In Texas, you'll often see these where an exit ramp merges into its own lane on the frontage road. SINGLE SOLID WHITE LINE: This is used to channelize traffic and indicates that changing lanes is discouraged, although not specifically prohibited. You can cross it if you have to, but you should avoid it if possible. Even a thick single white line can be crossed if necessary; however, they are really discouraging you from crossing, so you should think twice about it. Note that there is an exception; see below. A single white line is also used to mark the right edge of the roadway or separate the right shoulder from the through lane. BROKEN WHITE LINE: A broken (dashed) white line separates lanes of traffic traveling in the same direction. SHORT BROKEN WHITE LINE: A short broken (dashed) white line marks a lane that will soon become an exit or turn only lane. In the explanation above, it is noted that crossing a single white line-- even a thick one-- is allowed. However, there is an exception to that-- the channelizing island. This is when there are two single white lines that are converging or diverging in a roughly trianglular shape. The area between the lines in this case is known as a "neutral area" in which vehicles are not allowed as it is considered to be the theoretical extension of the tapered unpaved "gore" area. (b) An operator may not drive on the left side of the roadway in a no-passing zone or on the left side of any pavement striping designed to mark a no-passing zone. This subsection does not prohibit a driver from crossing pavement striping, or the center line in a no-passing zone marked by signs only, to make a left turn into or out of an alley or private road or driveway. There is an exception to the above rule: if there are two sets of double-yellow lines, you may not cross over at all, including for left turns. 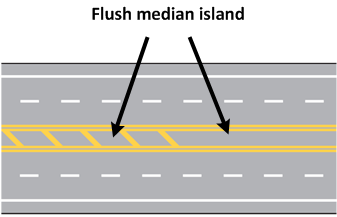 These areas are defined as "flush median islands" in the Texas Manual on Uniform Traffic Control Devices. As such, they have the same purpose and function as a physical traffic island and are legally enforceable as a "dividing space" for the purposes of §545.063(b) (see below.) These areas often also have diagonal hash markings to help emphasize that they're off-limits. (2) a red signal is to be given. Lots of folks have questions as to just what a yellow light really means. By law, a yellow light is simply a warning that the light is about to change to red. Technically, since no conflicting traffic can have a green while you have a yellow, you still have the right-of-way-- it's really just an extension of the green but letting you know that the green is ending. Therefore, you are still allowed to cross the stop line or crosswalk when the light is yellow, and as long as you have done so before the light turns red, you have not violated the law. Does this mean you should race to beat the red-- no, of course not. If the light is yellow and you have not passed the "point of no return" and can safely stop, you should do so. Note, however, that I said "safely" stop. If the road is wet and you don't reasonably think you could stop without sliding into the intersection or perhaps having the guy in back slide into you, then keep going (carefully, of course)-- your duty to prevent a crash is foremost. (a) The operator of a vehicle facing a flashing red signal shall stop at a clearly marked stop line. In the absence of a stop line, the operator shall stop before entering the crosswalk on the near side of the intersection. In the absence of a crosswalk, the operator shall stop at the place nearest the intersecting roadway where the operator has a view of approaching traffic on the intersecting roadway. The right to proceed is subject to the rules applicable after stopping at a stop sign. (b) The operator of a vehicle facing a flashing yellow signal may proceed through an intersection or past the signal only with caution. (c) This section does not apply at a railroad crossing. I added this section because a lot of motorists seem to be confused about the meaning of a flashing yellow signal, particularly when a regular traffic signal (red-yellow-green) is flashing yellow. (I'm specifically talking about a full circular flashing yellow like the one shown below, not the new flashing yellow arrows.) A flashing yellow signal simply means "proceed with caution", even when it's being displayed by a regular traffic signal. Inexplicably, I am seeing more and more people actually stop when they come upon a one of these. This is unnecessary and a bit dangerous because the person behind you is probably not expecting you to stop. It would be the same as stopping at a green light. You only need to stop if it is a flashing red signal; in those cases, treat the signal like you would a stop sign. Otherwise, just proceed through with a bit of extra caution since some yahoo on the intersecting street might think you have a flashing red, too, and suddenly shoot out into the intersection. (i) An operator of a vehicle facing a traffic-control signal, other than a freeway entrance ramp control signal or a pedestrian hybrid beacon, that does not display an indication in any of the signal heads shall stop ... as if the intersection had a stop sign. If a traffic signal is out of order (that is, all of the lights are dark), then the intersection reverts to a four-way stop. Some drivers will assume that if the light is off, they can just keep going, but if someone on the intersecting street thinks the same thing at the same time, then it should be obvious what might happen. Common sense also dictates that if the signals are otherwise obviously malfunctioning (e.g. two colors on at the same time or stuck on yellow), treat the intersection as a four-way stop as well. Note that this statute does not apply to signals on freeway entrance ramps (metering or "flow" signals) as well the new "HAWK" pedestrian crossing signals that are dark until activated. (2) turn left, if the intersecting streets are both one-way streets and a left turn is permissible. Here are two common questions related to legal turns on red. Whenever I drive downtown, I often end-up stuck behind someone on a one-way street stopped at a red light waiting to turn left onto another one-way street with no traffic coming. If only they knew that they were wasting their time (and mine) sitting there. A left turn on red is allowed when the street you are is one-way and the street you are turning onto is also one-way (to the left, of course). Makes sense if you think about it-- it's just a mirror image of a right-on-red. There are some people who believe that you can make a left turn at a red light at any intersection (i.e. two-way to two-way, two-way to one-way, or one-way to two-way). While there are some states that allow some version of this, Texas does not. Unless both streets are one-way, you can not make a left on red. Also, there are some who believe that you can make a left on red if there are no signs such as "LEFT TURN SIGNAL" or "LEFT ON GREEN ARROW". Again, not in Texas. Those signs are purely informational and as long as a signal is obviously intended to regulate traffic turning left (which a red signal to the left of green signals for through traffic would be), then drivers are required to obey it regardless of the absence of any signs. Turning left on a red light, unless both streets are one-way, is running a red light and you can be ticketed for such. In a related matter, I often get the question of whether it is legal to make a right on red from the left lane of dual right turn lanes. The answer is yes, so long as there aren't any signs prohibiting it such as those shown below. (f) Subsections (a), (b), and (c) do not apply if the avoidance of conflict with other traffic is necessary or if the operator is complying with the law or the directions of a police officer or official traffic-control device. The issue of waiting in an intersection is a little tricky. The law specifically prohibits stopping in an intersection. However, subsection (f) of the same law makes an exception "if the avoidance of conflict with other traffic is necessary." Therefore, the following sections cover the two conflicting issues regarding when to wait in an intersection. Paradoxically, many people do exactly the opposite of these. Sometimes, you come to an intersection where you want to turn left and there's a flashing yellow arrow or a green through signal but no green arrow. You may have seen people pull into the intersection and wait to turn left there and wondered, is that legal? The answer is, yes, it is. But how is this legal, though, when §545.302(a)(3) specifically prohibits stopping in an intersection? In this case, subsection (f) makes an exception "if the avoidance of conflict with other traffic is necessary". If you were to turn left in front of oncoming traffic, that would be conflicting with that traffic. Therefore, stopping so as to not conflict with oncoming traffic fulfills subsection (f), which then exempts you from the (a)(3) prohibition on stopping in an intersection. But if you're still in the intersection when the light turns red, wouldn't that then be considered running a red light? 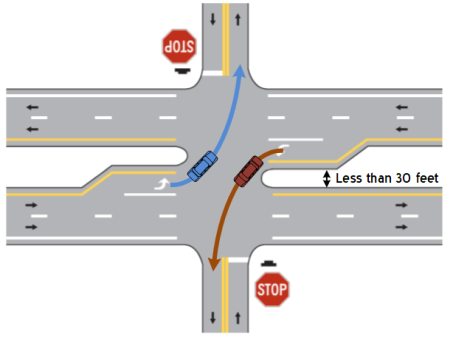 No, because you lawfully entered the intersection on a green and other traffic must by law allow you to clear the intersection before they can go (§544.007 (b)). So why would you want to do this? Because it helps reduce congestion. For every car that makes it through, that's one less car idling in line. The more people that do this, the more the benefit accrues. And at intersections without protected left arrows on busy streets, you often have to do this if you ever want to turn. Two caveats: First of all, don't do this if there is traffic on the street you want to turn onto that is backed up to the intersection or nearly so (see "Don't block intersections" below.) Secondly, if you're still in the intersection when your light turns red, make sure that that the oncoming traffic is stopping before you actually turn-- sometimes someone will be trying to beat the red. Also, sometimes oncoming traffic will still have a green even when your direction has a red. If this is the case, there should be a sign at the intersection that reads "ONCOMING TRAFFIC HAS EXTENDED GREEN", although not always. If there is such a sign, it is better for you to wait behind the stop line. The flashing yellow arrow signal now being widely deployed was developed specifically to eliminate this hazardous situation. If you are waiting in an intersection when the light turns red, don't back out of the intersection. Just wait for oncoming traffic to clear and then complete your turn. Don't panic if this means you have to wait in the intersection for a few seconds after the light has turned red-- just stay calm and wait until it's safe to turn. If anyone on the intersecting road honks at you, you can be secure in the knowledge that they're in the wrong. If the street you are on is bumper-to-bumper and you come to an intersection with a green light, remember: "Don't Block The Box!" You should not enter an intersection if congestion would prevent you from immediately vacating the intersection when the signal turns red. In other words, don't drive into an intersection unless you know you can get out quickly if the light turns red. So why doesn't the exception provided by subtitle (f) apply? In this case, you're not stopping to avoid conflicting with other traffic, you're stopping due to congestion, which is different. It's basically a matter of common sense and good faith in keeping with the spirit of the law. With the left-turn rule above, assuming there is nothing obstructing the street you want to turn onto, you will be able to vacate the intersection before or immediately after your light turns red and therefore won't be blocking the intersection for cross-traffic. With congestion, your egress is blocked by stopped traffic which will prevent you from being able to exit the intersection immediately when the light turns red and thus will leave you blocking the intersection for cross-traffic. By the way, this rule can also cancel the waiting-to-turn-left rule above: if you have a green light, or even a green arrow, but the street you want to turn onto is backed-up to the intersection, wait behind the stop line or crosswalk until there's room for you, then turn. 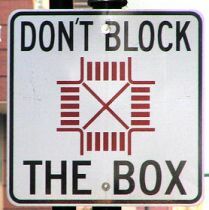 New York City had such a problem with blocked intersections that they started a public education program called "Don't Block The Box! ", and several Texas cities have now adopted it as well. Obstructing intersections in this manner causes traffic on the intersecting street to also become congested. This leads to the phenomenon known as "gridlock" where several blocks of traffic in all directions are "locked" because of obstructed intersections. Even if you have a green light, the law requires you to yield to traffic already in the intersection. So if someone on the cross street was hanging-out in the intersection waiting to turn left when your signal turns green, don't roar into the intersection and pound your horn-- they're legally there and have the right to make their turn unmolested and you're just being a putz by not giving them a few seconds to move on. I'm not sure where this rumor started, but I have gotten several inquiries about the legality of changing lanes in an intersection. In Texas, and in every other state that I could find, it is perfectly legal to change lanes in an intersection, so long as it can be done safely (which is always the requirement when changing lanes.) If this were the law, it would be very difficult to ever change lanes along most major streets since there is an intersection every few hundred feet! Hopefully this will squelch this urban legend once and for all. (4) awaiting access to a ferry operated by the Texas Transportation Commission. Notice that the statute specifically says "an operator may not drive to the left side of the roadway". This is different than the changing lanes discussed above. "Changing lanes" is when there are two or more lanes for the direction you are traveling and you wish to change between those lanes. "Driving to the left side of the roadway" is just that-- going across the yellow line down the middle of the roadway and crossing into oncoming traffic. As you can see by the statute, doing this is illegal within 100 feet of the approach of an intersection. My guess is many people misconstrue or misremember this rule to mean that you can't change lanes at an intersection. However, the two are completely separate things; there is no restriction on changing lanes. That said, you should avoid changing lanes while approaching an intersection, especially if you see someone waiting at the intersection. That person may decide to make a turn onto your roadway based on which lane you're in. For instance, if you're in the left lane, someone may use that as an opportunity to turn into the right lane. If you suddenly change into that lane after they've committed themselves to making that turn, then you're creating a dangerous situation for both yourself and the other driver and may very well end-up in a crash because of it. Even if you have a green light, you should always look both ways before you cross any intersection. You don't know... there could be somebody running the red or maybe an emergency vehicle approaching. So always look both ways before you cross any intersection. (C) the visual signal is no longer actuated. (B) where pedestrians are not permitted to cross the roadway. (2) a highway is not considered to have separate roadways if the highway has roadways separated only by a left turn lane. It's been widely reported by numerous school districts and police agencies that many drivers either have no clue about the requirement to stop for school buses, are simply are not paying attention, or frankly are in too big of a hurry to stop (I hope it's not that last one, although in this day and age, it's certainly possible.) The law is simple: if you are approaching a school bus that has stopped and its red lights are flashing, you must stop. Most school buses also have one or more stop signs on the driver's side that swing out to remind you of your duty to stop.Traffic heading in both directions is required to stop and the requirement to stop applies in both urban as well as rural areas. Once you have stopped, you are required to remain stopped until the lights stop flashing, the bus has started moving again, or the driver waves you to move on. Note that in Texas traffic code, the term "highway" is defined to mean any public roadway, including city streets (§541.302). There are a couple of exceptions to the requirement to stop. One is if there is a median, island, or physical divider between you and the school bus; in those cases, you can proceed, but I recommend that you do so cautiously in case any kiddos are crossing carelessly (it's been known to happen.) Note that the law specifically indicates that a left turn lane does not count as a divider-- this means that even on a street with three lanes in each direction plus a center turn lane, traffic in all seven lanes must stop for a school bus. (The reason for the difference is that an island provides a safe place for pedestrians to wait for a break in traffic while a left turn lane doesn't.) There is also an exception for when a bus is stopped in a loading zone on a controlled-access highway (i.e. a freeway), but that seems to be an artifact from the old days as I have never actually seen one of these. A common question is whether you have to stop if a school bus is stopped at an intersection but is on the intersecting street, i.e. is not on the same street you're on, and you're traveling straight through or turning away from the bus. The law is not clear on this. However, the statute reads that you have to stop "when approaching from either direction." This would seem to indicate that you have to be moving toward the bus from the front or rear. If the bus is on a different roadway than you, you're not really approaching it from either of those directions. Furthermore, it says drivers "shall stop before reaching the school bus", but if you're on an intersecting roadway, you would never "reach" the bus. Finally, the title pretty much indicates the intent of the statute-- that drivers may not pass a stopped bus. Again, if you're on an intersecting roadway, you would never "pass" the bus. Given all of that, it appears the law does not require you to stop in this situation. That said, if the bus is at or in close proximity to the intersection, and you're not on a major thoroughfare (where stopping unexpectedly poses a hazard), it's probably a good idea to stop, if not for legal reasons, then certainly for safety-- especially if there are kids who look like they might want to cross your street. If you do chose to proceed, do so with extreme care. Now, if you're approaching a school bus stopped across an intersection from you on the same street and you wish to turn before reaching the bus, that's even less clear. In that case, it's probably best to stop. As a footnote, I've seen some school bus drivers who will stop their bus in the intersection to make this all a moot point, and some jurisdictions (wisely) place their stops mid-block to avoid any such issues. School buses are required by law to stop at all railroad crossings. When they do this, they usually switch on their hazard flashers to warn traffic behind them of the impending stop. You are not required to stop for the bus in this case (unless you are directly behind them, of course.) You are only legally bound to stop when the alternating red lights at the top of the bus are flashing. It should also be noted that sometimes when discharging or boarding passengers, the driver may determine that there is not a need to stop traffic, for example, when stopped in a loading area in front of a building, and will only activate the bus's hazard flashers. Again, in this case, you are not required to stop; however, you should proceed with extreme caution. Finally, most school buses also have yellow alternating flashing lights next to the red ones; these are used to warn drivers that the bus is about to stop. You are not required to stop when the yellow flashers are on, but you should be prepared to do so. Essentially, they have the same meaning as a yellow traffic signal-- a warning that the the red lights will come on shortly. (3) stop and remain standing until the authorized emergency vehicle has passed. (b) This section does not exempt the operator of an authorized emergency vehicle from the duty to drive with due regard for the safety of all persons using the highway. (3) a Texas Department of Transportation vehicle not separated from the roadway by a traffic control channelizing device and using visual signals that comply with the standards and specifications adopted under Section 547.105. (d) If conduct constituting an offense under this section also constitutes an offense under another section of this code or the Penal Code, the actor may be prosecuted under either section or under both sections. The purpose of the first law quoted above is obviously to give emergency vehicles a clear path, and the reason they need that right-of-way is also obvious. Think of it like this: if you or a loved-one needed help and called 911, wouldn't you want everyone to make way for those emergency vehicles? The second law requires drivers who are approaching an emergency vehicle stopped on the road with their emergency lights flashing to do one of two things: move out of the lane nearest the emergency vehicle or slow down to 20 miles per hour below the posted speed limit (down to a minimum of 5 mph). In other words, if you're going down the freeway in the right lane and there's an emergency vehicle parked on the right shoulder ahead, you should immediately move into the next lane to the left. If you can't, or if you're on a road where there is no extra lane to move over to, then you must slow down to 20 mph below the posted limit. The purpose of this law is to give emergency workers a safe area to work in when they're on or near the road. The "move over" law was expanded in 2013 to include moving over or slowing down when a tow truck or TxDOT vehicle is parked on the side of the road with its lights flashing. If you're stopped at the head of the line at a red light and an emergency vehicle with its lights flashing and siren sounding is behind you and can't get through or around the traffic, then you should first try to make room for them if at all possible by scooting over. If that is not possible, then you should consider running the red. The law does not specifically require or allow this, but the spirit of the law dictates that the right-of-way of the emergency vehicle takes priority over the traffic signals. Before you go through the red, though, make sure it is absolutely safe to do so. In most cases, cross traffic will see your predicament and stop, but if not, nudge slightly into the intersection as a signal to other drivers but wait until it is safe before you cross. Then, go through the intersection, pull over and stop. A safer alternative would be to turn right, but again, only when it is clear to do so. (a) An operator who stops or parks on a two-way roadway shall do so with the right-hand wheels of the vehicle parallel to and within 18 inches of the right-hand curb or edge of the roadway. (b) An operator who stops or parks on a one-way roadway shall stop or park the vehicle parallel to the curb or edge of the roadway in the direction of authorized traffic movement with the right-hand wheels within 18 inches of the right-hand curb or edge of the roadway or the left-hand wheels within 18 inches of the left-hand curb or edge of the roadway. This subsection does not apply where a local ordinance otherwise regulates stopping or parking on the one-way roadway. When parallel parking on a street, it is illegal to park facing oncoming traffic. Lots of folks do it, though, especially in residential neighborhoods. But it's illegal because it's generally unsafe for several reasons. First of all, to park facing traffic requires one to drive on the wrong side of the road, which is illegal unless overtaking another vehicle or passing an obstruction. And in doing so, pedestrians, cyclists, or other motorists are not likely expecting you to be coming from that direction on that side of the street and may enter the street without looking for you. Secondly, all cars have reflectors on the rear, but the front of most cars do not have reflectors, so when parking at night, a vehicle facing the wrong was is less visible, especially in low-light conditions. Also, someone approaching a vehicle parked the wrong way in low-visibility conditions may misinterpret which side of the road it's on and attempt to go around it on the wrong side. Also, when leaving a parking space when parked facing traffic, you have to clear traffic from both directions, a more complicated task, especially from a parallel position. But, perhaps the biggest issue is because when you are parked the wrong way and another vehicle parks in front of you-- especially one that is larger-- your view of traffic will be nearly completely blocked since the driver is on the curb side instead of on the traffic side. Therefore, you would have to pull your vehicle substantially out of the space and into the traffic lane before being able to see oncoming traffic. But, you say, you park where someone won't park in front of you. Yes, then in that case, this specific reason wouldn't apply. However, the law does not provide that exception, and for good reason-- sure, maybe there's not a place to park in front of you. But what if a car broke down there? Or someone parked illegally there? Not to mention that the other safety reasons mentioned above still apply. So take the extra 30 seconds to turn around and park facing the right way. Many people, when parked illegally, will switch on their hazard lights (flashers.) I've heard that they do so to indicate that they're parking for "just a minute" and that they'll be right back. Some even believe it somehow legalizes what they're doing. If the sign says "no parking", then that means no parking. At all. It doesn't mean "no parking except for a minute or two." If that's what they meant, then the sign would say that. So switching on your hazards to say you'll be back in a minute doesn't exempt you from the law. In fact, many parking enforcement officers say that a car with their flashers on is a beacon to them that the car is parked illegally. And, it also tells them that the driver knew they were parking illegally. The upshot is that using your flashers when you're illegally parked does not magically make it legal. (2) when light is insufficient or atmospheric conditions are unfavorable so that a person or vehicle on the highway is not clearly discernible at a distance of 1,000 feet ahead. First, let's talk about the law in this situation. The law requires you to use all your lights (including headlights) at nighttime, which is defined as being one half hour after sunset to one half hour before sunrise, as well as any time when you cannot see clearly for 1,000 feet, which essentially covers all inclement weather as well as dusk and dawn. Therefore, you should never be driving with just your parking lights on. If you're in a situation where you need to have any lights on at all, then you must use all your lights, which includes your headlights. Some people will say that they don't want to use their headlights during bad weather or at dusk because there's enough ambient light for them to see and their headlights won't be illuminating anything. However, headlights are not only for lighting-up the road ahead for you to see, but they also make you more visible to other drivers. Headlights are visible at a greater distance than parking lights alone. This is why motorcycles and emergency vehicles always use their headlights and is also the rationale behind daytime running lamps (see below for more discussion on DRLs.) So whenever visibility is reduced, you should use your headlights, if not to help you see but to help others see you. Others may argue that using their headlights puts a strain on their electrical system or battery. This is simply not true. Your vehicle's electrical system is designed to operate all of the vehicle's electrical devices, including the headlights. Your battery is only used to start your car and to power electrical devices in the car when the engine is not running. When your engine is running, the alternator, which is cranked by the engine, is providing power to your vehicle as well as recharging your battery. If using your headlights does indeed cause electrical problems for your car, then your car is unsafe and needs repair. So what are parking lights for then? They're mostly a relic from before hazard flashers were common. Their purpose was to give your car visibility while stopped on the side of the road. They're essentially obsolete now and many manufacturers have eliminated them. Note that parking lights are not the same as Daytime Running Lamps. Parking lights are when you can activate the front and rear marker lights without turning-on the headlights (see the photo below for an example.) These are intended to make your vehicle more visible while it is parked on the side of a dark road, thus the term "parking lights". However, as discussed above, parking lights mostly obsolete nowadays and many recent model vehicles in the United States are no longer equipped with them. 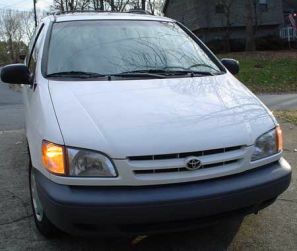 For vehicles that have parking lights, there is typically an third setting or position on the headlight switch-- position 0 is off, position 1 is the parking lights, and position 2 is all the lights including the headlights. Daytime running lamps are essentially the opposite of parking lights-- they're the headlights illuminated (although some vehicles now have a completely separate set of lamps for the DRLs) with the front, rear, and side marker lights off and are generally automatically controlled. Wikipedia has a good write-up on the differences at http://en.wikipedia.org/wiki/Automotive_lighting. (a) An operator shall use the signal authorized by Section 545.106 to indicate an intention to turn, change lanes, or start from a parked position. (b) An operator intending to turn a vehicle right or left shall signal continuously for not less than the last 100 feet of movement of the vehicle before the turn. (c) An operator may not light the signals on only one side of the vehicle on a parked or disabled vehicle or use the signals as a courtesy or "do pass" signal to the operator of another vehicle approaching from the rear. It might seem logical that if you are in a turn-only lane, you don't need to signal your turn. As you can see above, however, the law is quite straightforward-- you must use a turn signal any time you want to turn or change lanes. There is no exception for turn-only lanes. The reason is simple: while it may be obvious to you and to the guy behind you that you are in a turn-only lane, it may not be evident to motorists or pedestrians across the intersection or on the intersecting road. Using your turn-signal clearly indicates to everyone who may need to know that you are are going to turn. Some states waive the requirement to use turn signals if no other vehicles are in the vicinity, but Texas has no such exception. You don' t know what you don't know, so you should always signal in case there's someone nearby you don't see. (a) To make a right turn at an intersection, an operator shall make both the approach and the turn as closely as practicable to the right-hand curb or edge of the roadway. (2) after entering the intersection, turn left, leaving the intersection so as to arrive in a lane lawfully available to traffic moving in the direction of the vehicle on the roadway being entered. (c) On a street or roadway designated for two-way traffic, the operator turning left shall, to the extent practicable, turn in the portion of the intersection to the left of the center of the intersection. (d) To turn left, an operator who is approaching an intersection having a roadway designated for one-way traffic and for which signs are posted from a roadway designated for one-way traffic and for which signs are posted shall make the turn as closely as practicable to the left-hand curb or edge of the roadway. (2) require a course different from that specified in this section for movement by vehicles turning at an intersection. Imagine you are on a street approaching an intersection with lanes marked like the right hand illustration above. Recently, I have seen an increasing number of people turn from the two center lanes. BUZZ! 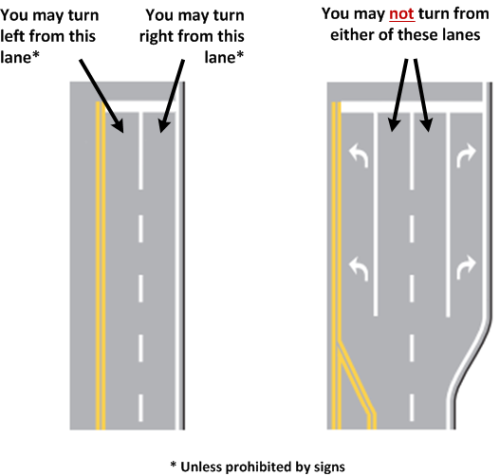 Unless there are signs and/or lane markings indicating otherwise, the law only allows you to turn left from the far left lane or to turn right from the far right lane. When there are dedicated turn lanes like those in the right hand example above, those lanes fulfill those roles. So, for example, if you wanted to turn right from the right hand through lane (i.e. the lane immediately to the left of the right-only lane), you would only be permitted to do so if it was marked as shown in the right hand illustration below. OK, now that we know which lane to turn from, we need to know which lanes we can legally turn into. In Texas, when turning right, you are required to turn both from the right lane (as discussed above) and into the right lane unless there is an obvious safety reason not to (e.g. you're driving a long vehicle or there is a pedestrian or debris in the road) or, of course, if there are signs are markings indicating otherwise (e.g. a double turn lane.) When turning left, however, you are permitted to turn into any lane designated for traffic headed in that direction and it is recommended that you pick the lane that interferes least with other traffic. The exception is if you're turning left from a one-way street onto another one-way street; in that case, you must turn from and into the left lane (i.e. the mirror of a right turn.) Also, if you are turning from one of two lanes designated for the same turn movement (i.e. double turn lanes), then you must turn into the appropriate lane as indicated by signs and/or pavement markings. And one final word: keep in mind that other people may not always follow the law, so be prepared to yield if necessary, even if you're in the right. Good driving habits dictate that you turn into the lane nearest you, so, if you're turning left, you should turn into the left lane if possible. (3) where the center lane is designated by an official traffic-control device for movement in the direction in which the operator is moving. Center two-way left turn lanes are for use only when preparing to turn left from the main road (such as onto a side street or driveway); they are not to be used as a through lane or to overtake another vehicle. You can also use this lane to make a U-turn where legal. Be sure to only enter the lane just before you are ready to slow down for the turn. This leads to a common question: how far before turning can you legally enter this lane? The answer is that there is no defined statutory limit as each situation is different and can vary depending on the speed of the vehicle, weather and traffic conditions, the presence of an oncoming vehicle in the lane, etc. Drivers must use their best judgment and not enter the lane too early or they may be perceived as using it as a through or passing lane. Police officers also have to use their judgment in enforcement and this difference in what may be considered "too far" often results in a citation. Therefore, read the first sentence of this paragraph again. Another question is whether you may use a two-way center left turn lane located upstream of a dedicated left turn lane at an intersection in order to pass traffic stopped in the through lanes if you want to turn at that intersection. Again, the law does not address this maneuver. If you use it to pass for a relatively short distance, then you're not likely to get cited. But if you're passing a long line of vehicles, you could get cited, especially if you're whizzing by at a high rate of speed or your action interferes with someone wanting to make an opposing left turn. The upshot: I would avoid doing it for more than a couple hundred feet or so. The Federal Highway Administration's "Read Your Road" guide (link at the bottom of this page) indicates that, when turning from a side street or driveway onto the main road, you may also use this lane as a temporary refuge to wait for traffic to clear as long as you pull into the lane and wait and don't use the center turn lane as an acceleration lane. However, it is important to note that Texas law does not seem to specifically permit this action (nor prohibit it for that matter), and I have had reports that some folks have been cited for doing this and the court has upheld their citation, so I would recommend avoiding this maneuver unless you absolutely have to, and if you do, absolutely do not use the center turn lane as an acceleration lane! 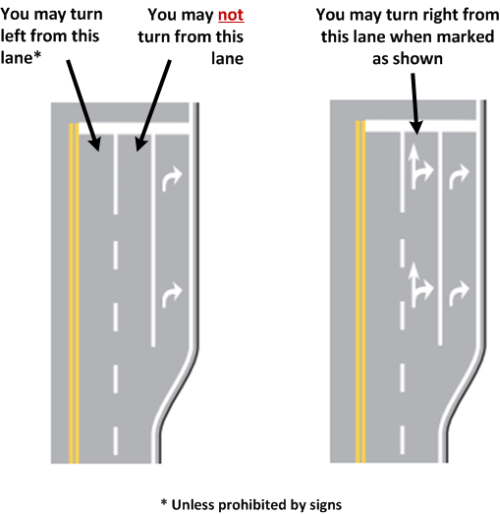 Finally, although section (b)(1) above says you can use the center lane for passing, keep in mind that center lanes marked as left turn lanes cannot be used for passing as the traffic signs and pavement markings indicating that the lane is for left turns only take precedence. Section (b)(1) is an artifact from days long ago where so-called "suicide lanes" were used on rural roads to allow passing in both directions; those lanes are pretty much all gone now and have been replaced by dedicated passing lanes for one direction or the other. Boy, this seems to be a hot topic of debate, especially in the Houston area: what is the proper way to turn left across a median? Specifically, do you keep to the near side when turning or cross over to the far side before turning? The answer: it depends, of course! In this case, it depends on the width of the median. In Texas, if the median is 30 feet or more wide (nominally), then the junctions on each side of the median are legally considered to be separate intersections (§541.303). This then means that a crossover through the median is considered to be a very short intersecting street of its own, but you still have to treat it as if it were 300 feet long. So in those cases, you must keep to the right as you cross over, just like would do turning onto a regular street. If the median is less than 30 feet wide, then the whole thing is considered one big intersection, so you would make a "regular" left turn just as you would if there was no median; that is, pass opposing left-turning traffic passenger-side-to-passenger-side. If a median is 30 feet wide or more, there will be yield or stop signs in the median, a set of double-yellow lines, and stop or yield lines; these are your cue to pass through like the first (top) example above. If there are no stop or yield signs or lane markings in the median, then that's your cue to treat it like the second example above. In these cases, there is often (but not always) a "keep right" sign on the median nose. Signalized intersections should generally always be treated this way, regardless of width. To be fair, there are locations where medians are signed as if they were wider than 30 feet when, in fact, they're not. And there are cases where medians wider than 30 feet aren't signed like they should be. In those cases, treat them as described above based on if they're signed or not unless it's quite obvious which category they fall into. By the way, the same rules above apply for U-turns. (c) Each junction of each roadway of a highway that includes two roadways at least 30 feet apart with the roadway of an intersecting highway, including each roadway of an intersecting highway that includes two roadways at least 30 feet apart, is a separate intersection. This is a good example of a confusingly-worded statute, so here's what it's saying: On a divided highway where the roadways are 30 feet apart, each junction on each side where it intersects another roadway are considered individual intersections. If two divided highways cross each other and both of them have roadways 30 feet apart, then all the places where they cross are separate intersections. (a) On a highway having two or more roadways separated by a space, physical barrier, or clearly indicated dividing section constructed to impede vehicular traffic, an operator shall drive on the right roadway unless directed or permitted to use another roadway by an official traffic-control device or police officer. (2) at a crossover or intersection established by a public authority. An operator may not drive on or from a limited-access or controlled-access roadway except at an entrance or exit that is established by a public authority. (a) An operator may not cross a sidewalk or drive through a driveway, parking lot, or business or residential entrance without stopping the vehicle. (b) An operator may not cross or drive in or on a sidewalk, driveway, parking lot, or business or residential entrance at an intersection to turn right or left from one highway to another highway. It is illegal to drive across any median. This includes the median between the freeway and the frontage road-- even when there’s a traffic jam on the freeway. If you want to get onto the frontage road, get off at the next exit. You’re an adult-- act like one and be patient. Crossing medians is rife with hazards to you, your car, and other drivers, and many times you won't gain much if any advantage doing so anyway. 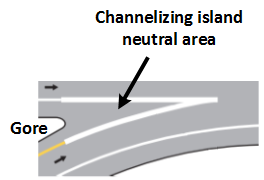 Also be sure to see the section about "flush median islands" in the lane markings section above. Similar to driving across the median, it is also illegal to cross private property for the purpose of turning left or right from one road to another. In other words, it's illegal to cut-through that gas station or shopping center on the corner so you don't have to stop at the stop sign or red light or to avoid the line of cars waiting at the intersection. An operator on an access or feeder road of a limited-access or controlled-access highway shall yield the right-of-way to a vehicle entering or about to enter the access or feeder road from the highway or leaving or about to leave the access or feeder road to enter the highway. This law is quite simple: if you're on the frontage road (a.k.a. access road, feeder road, service road, or gateway) of a freeway or expressway, then you must yield to traffic exiting or entering the freeway or expressway. This law covers all entrance and exit ramps, even if there are no yield signs. There is an exception-- when traffic exiting the freeway has its own added lane that is separated from the other frontage road lanes with a double-white line, then no yield is required since the exiting vehicles will become established in their lane on the frontage road (and thus are no longer considered exiting) by the point at which they are allowed to move cross the other frontage road lanes. At that point, the regular lane change laws apply. (a) Unless directed to proceed by a police officer or traffic-control signal, the operator of a vehicle or streetcar approaching an intersection with a stop sign shall stop as provided by Subsection (c). (b) If safety requires, the operator of a vehicle approaching a yield sign shall stop as provided by Subsection (c). (c) An operator required to stop by this section shall stop before entering the crosswalk on the near side of the intersection. In the absence of a crosswalk, the operator shall stop at a clearly marked stop line. In the absence of a stop line, the operator shall stop at the place nearest the intersecting roadway where the operator has a view of approaching traffic on the intersecting roadway. (a) Preferential right-of-way at an intersection may be indicated by a stop sign or yield sign as authorized in Section 544.003. (b) Unless directed to proceed by a police officer or official traffic-control device, an operator approaching an intersection on a roadway controlled by a stop sign, after stopping as required by Section 544.010, shall yield the right-of-way to a vehicle that has entered the intersection from another highway or that is approaching so closely as to be an immediate hazard to the operator's movement in or across the intersection. 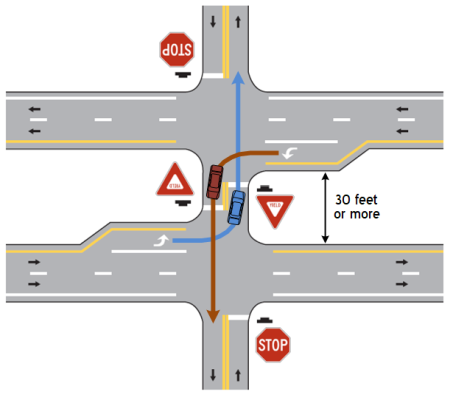 (2) yield the right-of-way to a vehicle in the intersection or approaching on another highway so closely as to be an immediate hazard to the operator's movement in or across the intersection. (d) If an operator is required by Subsection (c) to yield and is involved in a collision with a vehicle in an intersection after the operator drove past a yield sign without stopping, the collision is prima facie evidence that the operator failed to yield the right-of-way. There's a reason for having two different signs. "Stop" means that you must come to a complete stop, period. 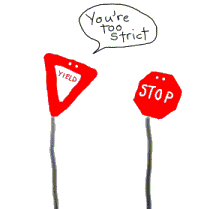 "Yield", however, doesn't always mean that you have to stop. Instead, a yield sign means that you must give the right-of-way to other traffic by slowing or stopping as necessary. You can satisfy the requirement to yield by just slowing down enough to let the other guy go by unmolested. If you can clearly see nobody is coming, then you can just proceed without slowing or stopping. So, if you're approaching a yield sign, start looking early and if the way is clear, just keep going. However, if it is necessary, you are indeed required to stop at a yield sign. Unfortunately, in many areas, it often seems that yield signs are placed where there should be stop signs and vice-versa. Europe overwhelmingly prefers yield signs; the US is ridiculously riddled with unnecessary stop signs. A lot of people might be surprised, but there is no specific Texas state law regarding who goes first at a four-way or all-way stop. The only applicable law states that drivers must stop and may enter the intersection only when it is safe to do so (§545.151). So that leaves the right-of-way assignment up to the drivers. To that end, there is a widely accepted convention that most drivers use to remove the guesswork. Basically, it's first-come, first-served. Implementing it is easy: when you stop at an all-way stop, look around and see who's already stopped. When they've all gone, it's your turn! If two or more people get there at the same time, then the protocol is that the person on the right should go first, and it should follow clockwise from there. Be aware, however, that some municipalities as well as other states do have laws that codify the order above. Also note that there are times when a driver doesn't necessarily have to wait for their turn. For instance, if you're the last to arrive at an intersection with cars already stopped on the other three approaches and you want to turn right, you could go immediately if the driver on your right starts to turn left or if the driver across from you goes straight since those movements don't conflict with yours and provide "cover" for you while you're turning. (b) An operator may not back the vehicle on a shoulder or roadway of a limited-access or controlled-access highway. Never, ever back-up on the freeway, even on the shoulder! Besides being illegal, this is extremely dangerous! Traffic is coming toward you at high-speed, and if you're backing-up, you're essentially going the wrong way and risk the equivalent of a head-on collision. If you miss your exit, just drive to the next exit, turn around, and go back. In most cases, you'll only lose a couple of minutes. Next time, make sure you know where you're going and pay attention to the signs. (b) If an accident occurs on a main lane, ramp, shoulder, median, or adjacent area of a freeway in a metropolitan area and each vehicle involved can be normally and safely driven, each operator shall move the operator's vehicle as soon as possible to a designated accident investigation site, if available, a location on the frontage road, the nearest suitable cross street, or other suitable location to complete the requirements of Section 550.023 and minimize interference with freeway traffic. (2) can be operated under its own power and in its usual manner, without additional damage or hazard to the vehicle, other traffic, or the roadway. Have you ever been caught in a traffic jam only to find that it was caused by a minor fender-bender blocking a lane and everyone is standing around waiting for the police? Maybe you've thought to yourself, "there oughta be a law..."
Well, there is. 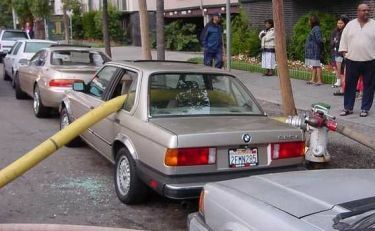 The law requires that anyone involved in an accident not obstruct traffic any more than is necessary. The law even specifically requires that, if an accident occurs on a freeway or freeway ramp in a metropolitan area and all involved vehicles can be safely driven, the motorists involved must move their vehicles off of the freeway immediately. This is to help prevent a traffic hazard and resulting congestion which, besides unnecessarily delaying others, also increases the likelihood of other accidents. Many people think that their insurance won't cover them if they move their cars from the scene before the police arrive, but this is absolutely false. The police and insurance adjusters can usually determine what happened based on the stories of those involved and the damage to the vehicles. Besides, in the case of most fender-benders, you legally don't even need to have the police come to the scene. But if you're worried, then quickly snap some photos of the scene and vehicles with your cell phone camera before you move out of the way. A common question I get, especially for newcomers to Texas, is whether it is legal to drive on the shoulder of a two-lane highway to allow other cars to pass as they have seen people doing. The answer is yes, it is, as declared in (a)(5) above. You'll find that many long-time Texans will automatically move onto the shoulder when a faster car comes up behind them on a two-lane road. It's just a common courtesy and helps the other person to pass them safely. However, there are some requirements to do this-- the shoulder must be wide enough and free of debris or stalled or parked vehicles (it is generally illegal to park on highways outside of business or residential districts). If you do move onto the shoulder to allow someone to pass, reduce your speed a bit, keep a sharp eye out for any obstructions ahead, and move back into the main through lane as soon as it is safe to do so. You are not allowed to drive on the shoulder to overtake another moving vehicle (except as provided above). In other words, if the vehicle you are following will not move onto the shoulder to allow you to pass, then you must pass them on the left when it's legal and safe to do so. One other frequent question is about using the shoulder to pass a long line of stopped traffic if you want to turn right at a driveway or the next intersection. Section (a)(4) above, on its face, does seem to allow for this. The main sticking point is the phrase "if that operation is necessary". The statute doesn't define what "necessary" is. However, there is case law that addresses this specifically. In Lothrop v. The State of Texas (2012), the Texas Court of Criminal Appeals (which is the supreme court in Texas for criminal cases) ruled that "necessary" had to be taken in context of the seven permissible reasons to drive on the shoulder. In other words, if you have to drive on the shoulder to pass a vehicle stopped in the main lane (as opposed to passing them on the left, for example), then that qualifies as "necessary". Many officers I've spoken with tell me that because of the uncertainty of this law, they usually won't cite for this or they will only cite someone who does this egregiously; for example, someone who is racing down the shoulder (which seems to violate the "be done safely" stipulation as discussed above), someone who gets on the shoulder well before the back of the line (because you're not actually passing any vehicles at that point), or someone who continues on the shoulder through an intersection. (Those all seem like good reasons to me to get a ticket.) But some officers and departments will always cite for this and leave it to a judge to decide. In short, while statutory and case law seems to allow this, it still seems to be a bit of a gray area in some jurisdictions, so YMMV and you should do this at your own risk. It seems everyone has a different idea of what is legal and isn't regarding U-turns. There is only one state law specifically regarding U-turns: §545.102, which prohibits a U-turn if you are not visible within 500 feet of approaching traffic. Otherwise, U-turns are allowed anywhere as long as there is not a sign or local ordinance prohibiting it. However, many municipalities have ordinances limiting U-turns in specific areas, such as in business districts or at signalized intersections, and these restrictions may not be not signed. Check with your local police or traffic engineering department to see if there are any such ordinances in your city. If you want to make a U-turn at a traffic light, you cannot do so unless the left turn signal is green or, if there is no left turn signal, the light for through traffic is green. Whenever you make a U-turn, you must, of course, yield to oncoming traffic just as if you were making a left turn. If you make a U-turn with a green signal, anyone wanting to make a right-on-red is required to yield to you, but keep in mind that they may not realize you're making a U-turn until they've started making their turn, so be prepared to yield to them. Unless traffic on the freeway is completely stopped or you can't merge and there is no place else for you to go, do not ever stop on a freeway entrance ramp! This is an extremely serious traffic hazard. Drivers behind you are speeding-up to get up to freeway speed and are looking back up the freeway for a gap to merge into. They are not expecting you to stop! If you can't squeeze into traffic by the time you get to the end of the ramp, make sure your left turn signal is on and carefully continue on the shoulder (if it's clear) until you can safely merge into the traffic stream. If you're in the right lane of a freeway and see traffic preparing to merge, move over or make room for them to merge into. Although the law requires traffic entering the freeway to yield (basic right-of-way law, §545.151), good drivers make the effort to help-out other motorists. If you stop on the shoulder to change a flat tire or deal with some other emergency and you’re ready to get back on the freeway, get up to speed on the shoulder, then signal left and merge into traffic. Do not pull from a standing stop directly onto the freeway’s main lanes. This very action killed a mother and van full of children west of Ft. Worth back in the mid ‘90s. (2) preparing for a left turn at an intersection or into a private road or driveway. Before I explain this one, let me ask you this: where is the fastest water in a river? In the middle, of course. Why? Because this is the place with the least friction. This is the deepest part of the river and there are no ragged edges or shallow bottom to slow the water. A highway conceptually works the same way (think of it as a two-way river.) The right lane has the most "friction": entering and exiting traffic, stalled vehicles on the shoulder, etc. The left lane has virtually no friction. That is why it is reserved for faster-moving traffic. Imagine this scenario: you're in the left lane on the freeway going faster than other traffic and you come up behind someone going a little slower than you. Instead of waiting a few seconds for them to move over, you whip around them on the right. At the same time, someone going much slower than you is trying to get on the freeway at the same location. Now, both of you are creating a big hazard for each other and someone is going to have to give. This is why (a) you shouldn't pass on the right; and (b) you should move to the right if you're traveling slower than other traffic. The second part applies no matter how fast you are going. Notice that the law only says that traffic moving "more slowly" than other vehicles; there is no exception given for vehicles traveling the posted speed limit. If you're going the speed limit in the left lane and someone behind you wants to go faster, move over! You don't have any right to enforce the law (that's called vigilantism) and you're actually violating the law by not moving over. You never know-- that person may have a bona fide emergency. On the other hand, if you're the one behind the slower driver, have a little patience and give them a few seconds to realize you're there and to move over before you zip around them. I can't count the number of times I've seen someone in the left lane who wanted to move over but got trapped there because everyone immediately passed them on the right. Plus, the weaving of drivers who are constantly passing other vehicles causes hazards and the turbulence caused by those frequent lane changes is a frequent cause of so-called "phantom" traffic jams. On a roadway divided into three or more lanes and providing for one-way movement of traffic, an operator entering a lane of traffic from a lane to the right shall yield the right-of-way to a vehicle entering the same lane of traffic from a lane to the left. This is probably one of the least-known laws. When someone from the left lane and someone from the right lane both try to move into the same space in the center lane at the same time, who should yield the the right-of-way? In Texas, the law is that the person changing lanes from right to left must yield to someone trying to enter the same lane from the left. The reason why the left lane driver has priority is because the they may be moving over to allow another vehicle to pass, because they're getting ready to exit, or because they have an emergency and need to move to the shoulder. Although there’s no law requiring it, you should only change one lane at a time. If you need to get across several lanes, move over one lane, establish yourself in that lane for a few seconds, then move over to the next lane. And don't forget your turn signal each time as required by §545.104! What is the speed limit on the curve marked by the sign at the left? Most people would say 25 mph, but the answer is that we don't have enough information to know what the speed limit is here. The "25 mph" sign here is a speed advisory sign, not a speed limit sign. Speed advisory signs indicate the recommended speed for a particular hazard, but they are not a legal speed limit. Enforceable speed limits are marked by the familiar black and white SPEED LIMIT signs. So, the speed limit for this curve would be whatever the last black and white speed limit sign indicated (or the default speed limit for that type of roadway in the absence of a speed limit sign.) Despite that, it is a good idea to travel at or near the speed indicated on these signs-- you could still be cited for unsafe speed if you're traveling appreciably faster than what is posted, especially if you crash. It's also worth noting that advisory speeds and warning signs in construction zones can be enforced per §472.022 of the Transportation Code; this is why the seemingly superfluous "OBEY WARNING SIGNS - STATE LAW" signs are posted at the beginning of work zones. A study by the Federal Highway Administration back in the '90s determined that the formula used to calculate the advisory speeds on curves, which was developed back in the 1930s, was significantly outdated and was producing advisory speeds that were 10-15 mph below what modern vehicles can safely and comfortably handle. New methods and procedures for improving the setting of advisory speeds have been developed and many states are now updating advisory speed signs. If you are used to ignoring advisory speeds because they seemed too low, you'll need to start paying more attention to them. Across most of the state, especially in rural areas, it is the convention for drivers, out of respect for the deceased, to pull-over and stop while a funeral passes by. I suspect that as a result, many folks think that it is actually the law to do so. In fact, it is not. Also, while many states have laws that require drivers to yield to a funeral procession, Texas has no such law. However, funeral processions are usually escorted by peace officers, and obviously if they indicate for you to yield, then you must do so. Otherwise, if you're driving down the road and a funeral procession approaches, you are not obligated by the law to pull over. If you wish to do so, be sure to pull completely off the road so if others want to continue on, they can do so safely.